On October 13, the infamous street artist Banksy attempted to sell $60 canvases (worth tens-of-thousands of dollars each) to unsuspecting New Yorkers. In seven hours, he had just three customers. When news of this broke, the story took over New York. In that echo of media hype, we saw an opportunity for a little mischief, and a chance to make a statement about the nature of hype, public personas, and the value of art. 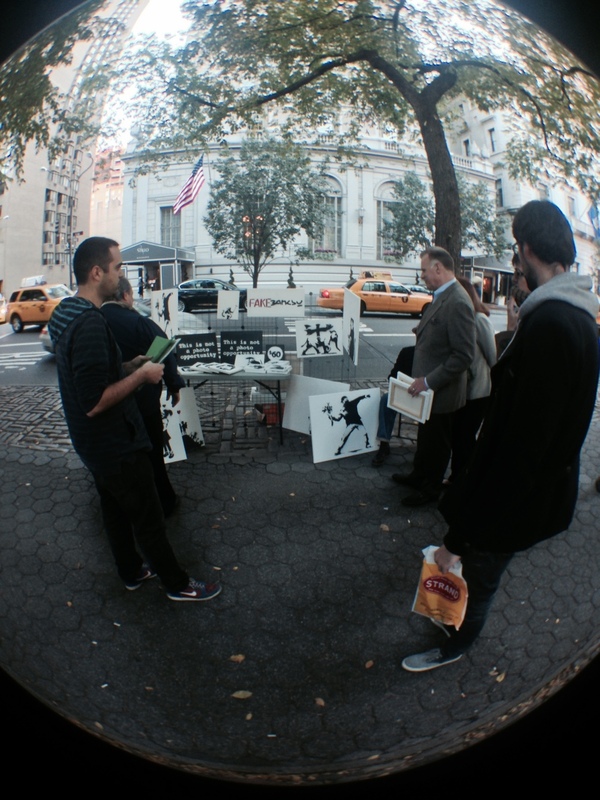 After a lot of hustle, Lance Pilgrim ( @TheElroyJenkins ) and I, with the help of film maker George Gross ( http://vimeo.com/georgegross ) recreated the Banksy stall one week later. The public consciousness had changed. Our work was completely worthless. We were open about this. Our sign said "Fake Banksy." Mike assured every customer that it was fake. Each canvas even came with a legally notarized "Certificate of Inauthenticity," claiming that what they bought was not an original Banksy. We sold everything in less than an hour. Including the price sign. Dave Cicirelli is an author and artist who creates hoaxes as social commentary. His book "Fakebook: A True Story, Based On Actual Lies" is available now at book stores everywhere. Lance Pilgrim is an artist and event promoter out of New York. He is art director and editor of the independent comic book "KODOJA", and hosts the classic NYC dance party "More Than Enough." George Gross is an award winning filmmaker whose films have screened in festivals all over the world, from Cannes to Tribeca. Michael Pilgrim is the man.